Things have been busy and I’ve not been particularly keen to open my laptop to write posts once I’m back home. But I thought I’d give myself a kick today and post a recipe I made last night. Nikujaga! That’s Japanese for ‘meat and potatoes’ and it’s a very common, very simple dish that’s served with rice. Due to its sweetness, it’s particularly popular with kids … and we like it too! Everyone seems to have their own ratio of soy/sake/mirin/sugar and I saw sugar amounts that ranged from 1 tbsp to 4 tbsp for the same amount of meat and potatoes. I went with my gut and the ratio below is what worked for us. For the thinly sliced beef, to get it fresh, you’re likely to need to visit a Japanese or Korean shop that sells fresh meat. I find a good source of thinly sliced meat is also the frozen section of Chinese shops as the thin slices of meat are frozen in rolls, ready to go into hotpot. I cut them in half and in they go into my pot directly. Easy. Heat a medium sized pot over medium-high heat and add the sunflower oil. Add the onion slices and saute until just started to get translucent. Add the beef and continue sauteing until the beef loses all its red colour. Add the potatoes, carrot, water and seasonings, stir well and bring it all to a boil. Lower the heat to a simmer, partly cover and continue cooking for about 30 minutes, until the carrots and potatoes are cooked through. Scatter over the frozen peas and continue cooking for another five minutes before turning off the heat. Go ahead and leave the dish to soak up the flavourful liquid until mealtime (it’s now a good time to make anything else you’re having for your meal!). Serve with hot white rice. There are only so many tomato salads one can eat… And to find simple ways to showcase our homegrown tomatoes, I soon turned to my little library of cookbooks rather than attempt to find anything online; I need something tactile this time! I adapted this from Apples for Jam by Tessa Kiros, a book full of simple recipes mainly targeted towards families with young children but also very suitable for the time-poor. This recipe for fried tomatoes works for any large tomatoes you may have – just don’t bother with those smaller than a golf ball. What you end up with is concentrated tomato juiciness, kind of like roasted tomatoes but y’know, without the need for turning on an oven. And it still tastes fresh, fresh and yet also roasted. It kind of reminds me of those fried tomatoes you get with full English breakfasts, only better. I dislike fried tomatoes in breakfasts only because they tend to be from a can (they just have a canned flavour to me) or a fried winter tomato, all anaemic and bland. These would be fabulous with a homemade full English or as a side dish to any meat. We had them with pan fried fresh homemade sausages from our local Polish shop. This is more instruction than recipe so I won’t be bothered with an ingredient list. You want some big, meaty tomatoes cut into quarters, smaller if they’re really huge. Heat a pan over medium high heat and add a drizzle of olive oil. Put in your tomatoes, one or two smashed garlic cloves, and a fresh rosemary sprig. Turn the tomatoes as their sides turn a burnished golden colour. When coloured on all sides, turn down the heat – you want to cook them gently to allow their juices to escape and bubble with the aromatics. Now’s a good time to give everything a sprinkle of salt. Cook, turning the wedges gently occasionally, until there’s almost a sticky syrup at the base of the pan but the wedges are still in one piece. 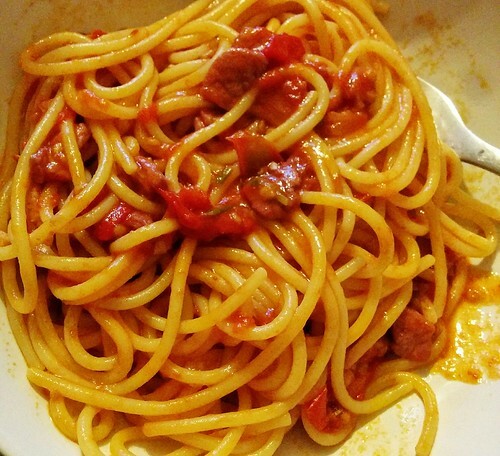 Finally, drizzle with an excellent extra virgin olive oil and serve with lots of crusty bread. A recipe! I haven’t had one of those on here for a while! 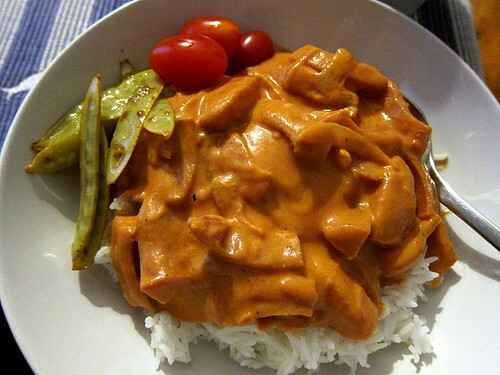 This curiosity comes from Sweden – after my return from Stockholm, I was reading about their cuisine in general when I came across korv stroganoff. Now I’m familiar with the beef in a creamy sauce Stroganoff but when I heard that the most popular variant in Sweden involved sausages and ketchup, well, I was all over it. As you’d expect, it’s a favourite meal of many Swedish children. I didn’t have any falukorv, the baloney-like sausage typically used in korv stroganoff, and substituted an equally as processed sausage that can be found in Ikea at certain times of the year: prinskorv. The recipe was very simple to put together and provided you’ve got some white rice cooked, you’ll have your meal on your table in 15 minutes. Of course, it’s very mild (a little chilli powder wouldn’t be amiss) but it is certainly comforting. It’s also very rich and I’d certainly ensure you had a big ol’ salad and some pickles to have on the side! Slice the sausage(s) into strips. Slice the onion likewise. In a sauté pan over medium heat, add the olive oil and then the onion, cooking then until they’re soft and translucent. Add the sausage strips and continue frying until they’re heated through and maybe even a little brown on the edges. Add the passata and ketchup and stir through, letting it all bubble gently together for a couple of minutes. Stir through the cream and again, continue cooking. After a couple more minutes, season to taste and then serve hot on white rice. You’re going to want a big fresh green salad alongside! 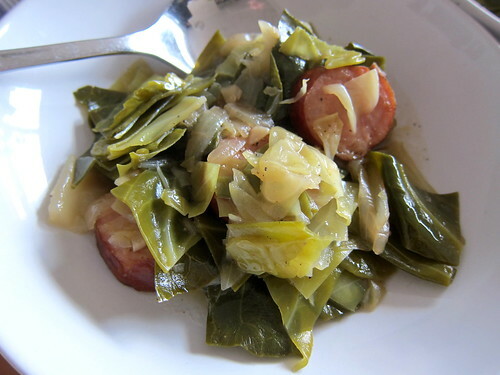 Oh, how I wish I could title this post Kielbasa and Kabbage! We’ve had a Mleckzo Polish delicatessen open up in Croydon recently and I am in awe at the selection of kielbasa (Polish sausage) that is available – there must be at least 50 different kinds in their refrigerated display cabinet! They’re all different colours too – some more reddish, others darker and possibly smoked. Some are pork only, others are beef, still others are pork and beef or turkey. Anyway, I have no real idea how to use all of them but I do know that a lot of them will work well cooked with cabbage. I don’t claim that this is a particularly Polish recipe – I just put it together based on what I had to use up in the house. And it tasted great! 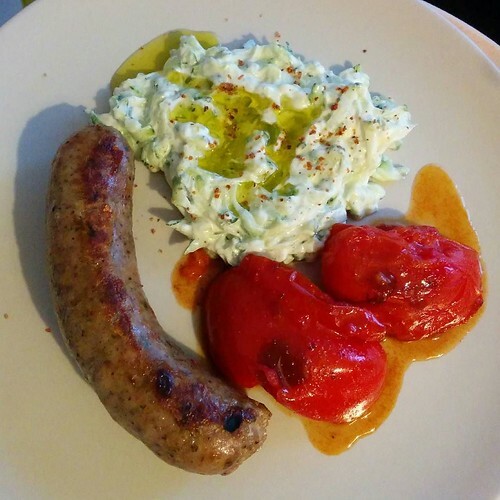 I love the combination of the strong sausage with the cabbage – I love cabbage in stews. I’ve tried this now with a couple different types of cabbage and a few different kielbasas from the display. Unfortunately, I cannot recall the different types as they are all labelled in Polish, which I don’t read! Ah well. Cut up your onion and soften it over medium heat in a little olive oil in a large saute pan. Slice the kielbasa into bite sized slices and when the onion is soft, add them into the pan with the caraway seeds. When they have browned a little, pour in the cider and let it all bubble. Get your cabbage cut up into bite sized pieces, leaving the core. Add them to the pan, stirring through and adding a little more water if it’s looking dry. Cover and reduce the heat and let simmer, stirring occasionally, until the cabbage is cooked to your liking. Season to taste. Serve hot with a little bread on the side – rye is a good choice. 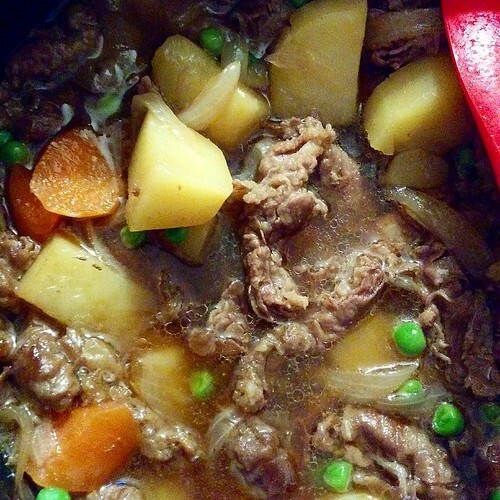 I first came across Hawaiian oxtail soup…well…via unconventional means. I saw our hero, the Solitary Gourmet, tucking into this apparently common Hawaiian dish in Japan. There are many cultural links between Hawaii and Japan and it makes sense that one can find the former’s dishes in the latter country. Hawaiian cuisine is a bit difficult to find in London and what’s available is all just a little bit more dressed up from what I can see is available on the original islands. No loco moco, no Spam musubi, no plate lunches. 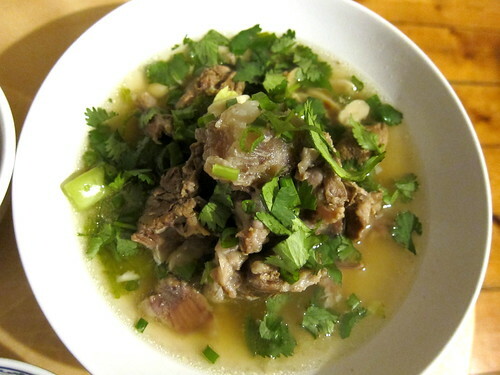 And certainly no oxtail soup, which apparently is commonly found throughout the state. Luckily, it’s an easy soup to make – essentially you dump everything into a pot and play a long game. There’s a tiny bit of fiddlier preparation with the oxtail where you parboil and trim the fat and I’m definitely going to do this with oxtails in future recipes too as it makes things all clearer and less fatty. Oh, and most importantly, it’s delicious – the oxtails were falling off the bone and the soy and ginger were perfect with it. It’s perfect for a cold day. Place all the oxtail into a large pot and cover with boiling water. Set over high heat and bring it to a boil. Reduce the heat to a simmer and let cook for 20 minutes. Drain the oxtail, rinsing them under cold water – do ensure you get all the tiny bits of bone off. Trim the oxtail of fat and then place them back into the now empty pot. To the cleaned oxtail, add the dried orange peel, star anise, and ginger. Cover with water and bring it to a boil. Reduce the heat and let simmer, half covered, for an hour. Add the peanuts and some salt and continue cooking until the oxtails are very tender – this will be about 2-2.5 hours longer. Adjust the salt to taste. Cut the bunch of mustard greens into large pieces and add them to the soup. Let them cook for 10 minutes and the soup is ready. In the meantime, prepare the stuff to serve with the soup. Chop up lots of coriander. Thinly slice lots of spring onions. Cook some white rice. Grate some ginger. 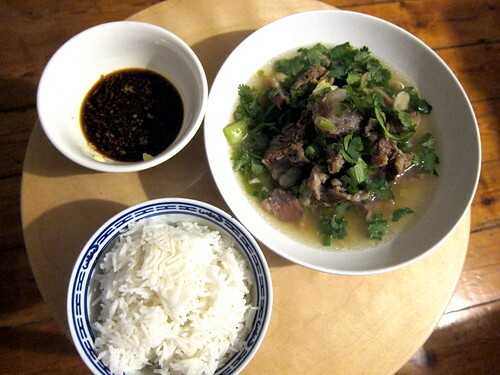 When the oxtail is ready, ladle some into a bowl and top with the coriander and spring onions. Serve the rice in another bowl. In a dipping bowl, place some grated ginger and top with light soy sauce (adjust to your taste). To eat, pick out the meat from the oxtails and dip into the soy/ginger mix. The rice can be eaten alongside or dumped into the remaining soup to be eaten like a congee. Enjoy! I returned from that trip to Arundel with a slight obsession with cheese scones. We had them twice there – a sturdy savoury one at Motte & Bailey Cafe and a tender flaky one at Belinda’s. Both were served warm and with plenty of butter. Hot savoury salty strong cheesy scones with cold butter… I fell in love. 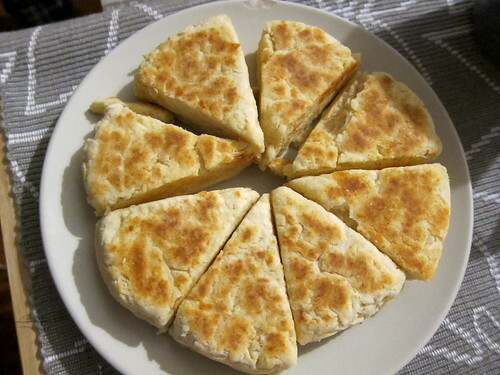 Alas, we still don’t have an oven at home but I discovered, after a bit of searching, girdle scones… a Scottish type of scone that’s cooked on a girdle, i.e. a griddle. Perfect! Essentially all I’d need is a flat surface over heat – I had that at least! It’s exactly like a scone – simple ingredients, minimising handling of the dough, quick cooking. And even if you do have an oven, with this recipe, there’s no need to preheat it! The scones I made were perfect and puffed up nicely over the heat. Flaky, savoury…. oh boy, time to make another batch. Combine the flour, baking powder and salt well. Cut in the cold butter until the butter pieces resemble rolled oats. Stir in the cheese. Add the milk a little at a time, mixing it in each time – you may not need all of it. If it feels too wet, add some flour. But don’t overwork the mixture; use a light hand. Form the soft dough into a round about 1.5 cm thick. Cut this round into 8 wedges. Heat a frying pan (I used nonstick but I think cast iron would be good too) over medium low heat. Place the round into the pan, keeping the wedges tightly together. Cook them on both sides until they are cooked through and golden brown on their sides. This will be about 5-7 minutes per side. If you’re concerned about the centre not cooking through, you can also put their cut sides directly over the heat. For a sweet version, skip the cheese and add some sugar and currants. I reckon these can be easily customised.